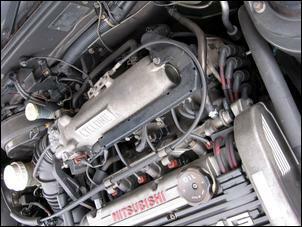 Think that the only high-performance version of the Mitsubishi Galant is the VR4 AWD turbo? Guess again! If you’re a fan of naturally aspirated performance, you’ll love the Japanese market Galant AMG. Pop the bonnet of the AMG enhanced Galant and there’s not much to drool over – it looks much the same as the plain Galant DOHC engine. But venture onto the road and you’ll find the AMG keeps punching where the base engine runs out of breath – torque holds strong to around 8000 rpm! So how does the AMG deliver its top-end kick? Easy - with traditional hot-up techniques. 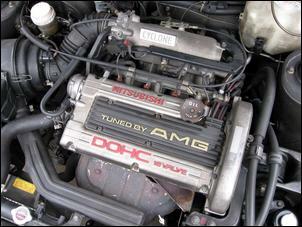 The AMG version features new pistons (which raise the compression ratio from 9:1 to 10.4:1), piston oil jets, aggressive camshafts, titanium valve springs, hollow rocker arms, a high-flow exhaust manifold and muffler, dual-stage Cyclone intake manifold and revised engine management. Give it a tank full of high-octane unleaded fuel and the AMG tuned 2-litre (coded 4G63) pumps out 125kW at 6750 rpm and 191Nm at 5000 rpm. This places it squarely between the 103kW Galant GSR and the 148/151kW turbo VR4. The AMG engine is mated to an upgraded 5-speed manual or 4-speed auto transmission. The upgraded 5-speed (as fitted to our test car) comes with relatively short ratios, a larger diameter clutch and a beefier passenger side driveshaft. The AMG delivers its tuned 2-litre grunt through the front wheels and, without a LSD, you need to be gentle when launching off the line. Too many revs means too much wheelspin. Still, we recorded 0 – 100 km/h performance comfortably in the mid 8 second range – not bad for a medium sized 2-litre sedan. There is slight torque steer that can be felt when ripping up through the gears but in normal driving it's undetectable. Throw it through corners and, as expected, there is some understeer and inside front wheelspin. The Galant AMG isn’t as surefooted as the AWD VR4 but the progressive nature of the engine helps ensue the chassis never does anything uncivilised. It’s easily controllable. The AMG suspension features gas-charged dampers but the springs are very soft. This means you enjoy a compliant ride but there is some roll and pitch when driving hard. 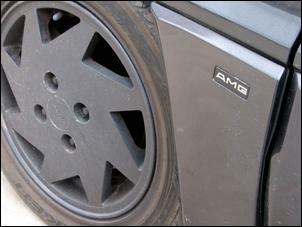 The brakes of the AMG are also beefed up. As far as we can determine, the AMG’s 2-pot front calipers are shared with the Australian-spec VR4. ABS was optional but was not fitted to our test car. The steering is a pleasant surprise. The AMG has a quick-rack arrangement (2.7 turns lock-to-lock in the auto and 2.8 turns lock-to-lock in the manual) and there’s better steering feel and precision than the VR4. 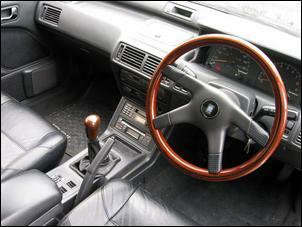 A small diameter steering wheel also contributes to the relatively sporty steering feel. Overall, the front-wheel-drive AMG has a much more chuckable and responsive feel compared to the VR4. At 1220 – 1240kg, this is the lightest high-performance Galant and it further benefits from excellent throttle response and direct steering. It has a nice, sharp feel to it. Inside, the AMG is comprehensively decked out. Standard equipment includes leather trim, power windows, digital climate control and a CD player (which is pretty impressive for 1989!). Our test car was also equipped with an optional timber trim package, which comprises inserts in the doors, a timber gear knob and Nardi steering wheel. The cabin is very comfortable and classy, though the small diameter steering wheel does block vision of the instrument cluster. This is a very practical four-door with the exception that it lacks a split-fold rear backrest – the ski-port is a poor substitute. 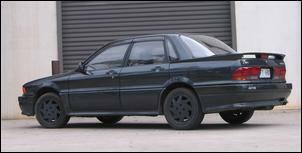 The late ‘80s Galant is a very conservative looking car but the AMG aero kit gives it a touch of aggression. The AMG wears a unique grille, three-piece rear spoiler, skirts, stickers and chunky 15 inch alloy wheels (wearing 195/60 15 tyres). Unfortunately, the dark grey colour of our test car hides many of the AMG’s distinguishing features. 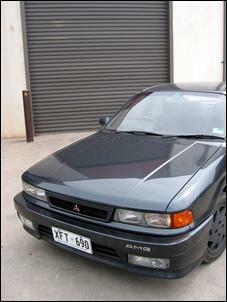 The Galant AMG was released in Japan during October 1989 and the last examples were sold in late 1990. 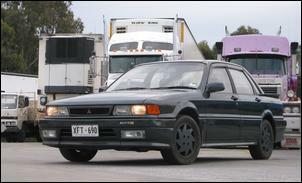 Our 1989 test car was supplied by Adelaide Japanese Imports and it presented as an honest 123,500km vehicle. The current price – which includes ADR-ing and on-road registration - is just AUD$7850. 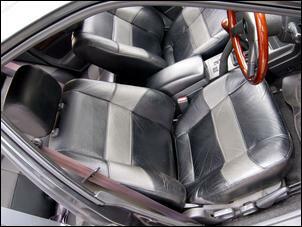 So what sort of buyer does the Galant AMG suit? Well, we reckon anyone that wants good all-round performance in a practical and economical sedan package. If you can’t insure a turbocharged VR4, this is a highly attractive machine. The majority of body and mechanical parts should be easy to source, though the AMG’s distinguishing engine, driveline and body components are hard to come by. At the time of writing, Adelaide Japanese Imports have a bare AMG-tuned engine arriving from Japan - it’d be wise to negotiate a deal that secures you a spare engine. If the standard performance of the Galant AMG gets boring you can easily upgrade the air intake and exhaust. The dual-stage Cyclone intake manifold can remain untouched – it provides an excellent spread of torque across the rev range. The Mitsubishi frequency output airflow meter can also be teamed with an aftermarket interceptor to tweak the mixtures and ignition timing. Combined, you can expect these mods to provide a 10 – 15 percent power gain (bringing the total to 137 – 143kW). The next logical step is to drop in the Galant VR4 turbo engine – but, then, that would go against AMG’s original intent. At this point you’d be better off with a VR4. Keep your mods subtle and you’ll have a very enjoyable relationship with the Galant AMG. It’s a sweet package that shouldn’t be underrated.